This is an English surname. It is locational and probably from Hopwell, a hamlet in the county of Derbyshire. The place is ancient being first recorded in the famous Domesday Book of 1086 as 'Opeuuelle,' but this seems to be a Norman-French version which was not repeated. 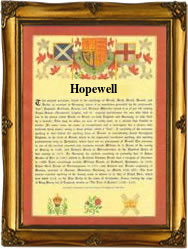 It became Hopewell in the pipe rolls of the county in 1166 and then Hopwell in 1242, a spelling which it has more or less maintained ever since, occasionally being recorded again as Hopewell. The place name means 'The spring at the hill top' from the pre 5th century Olde English 'hop' meaning top, and 'waella' a spring or sometimes a branch of a larger stream or river. Curiously this surname was originally a personal name, and one much favoured by the puritans. Examples include Hopewell Foxe of Gloucester in 1662 and Hopewell Voicings of Tetbury in 1720. The surname is not recorded in Derbyshire at all, but is first recorded in the surviving church registers of the city of London in 1628, with that of Thomas Hopewell at St Margarets Westminster, on February 1st of that year.